This pretty little ladybug wanted to come home with us from the nursery along with the Red Riding Hood (Penstemon schmidel) and Pincushion flowers (Scabiosa) we picked up for the garden. I was so happy to complete Track C of Meet the Masters before the end of our school year! 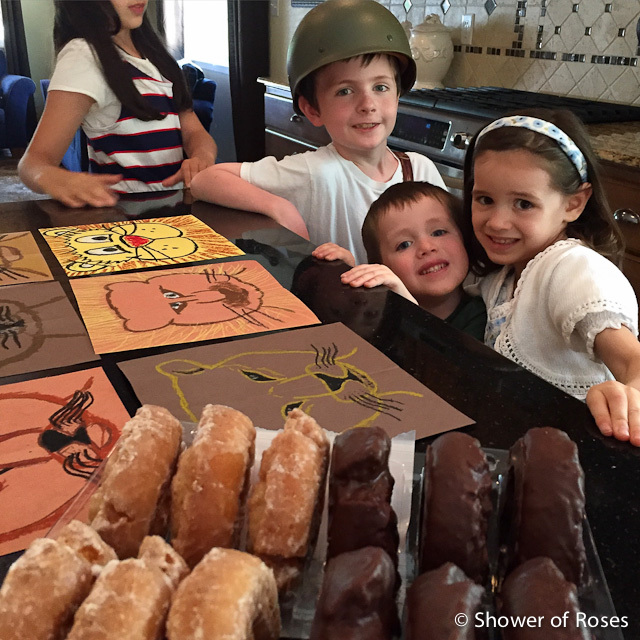 The kids were very happy that I pulled out donuts to celebrate! Bud: "What are you using the soap for?" Ranger: "I'm washing the car." Bud: "(Ranger), what are you using the soap for?!" 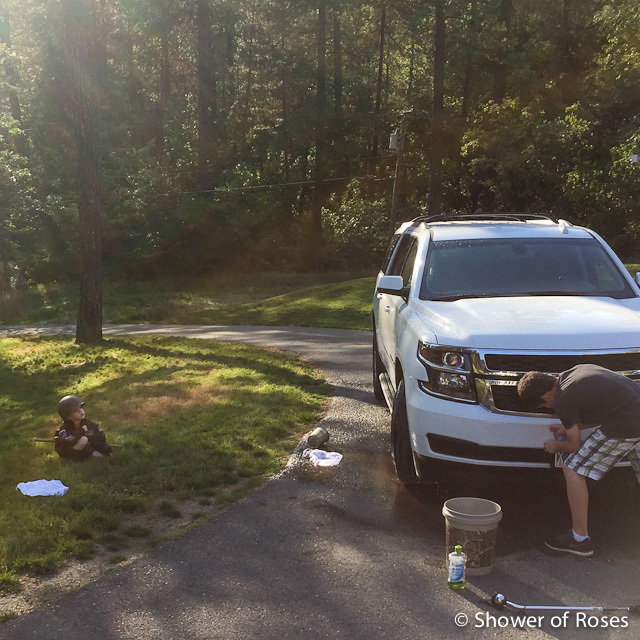 Ranger: "I'm washing the car!" Dad: "(Bud), he is washing the dirt off of the the car with the soap." Bud: "I want (Ranger) to tell meeeee!" 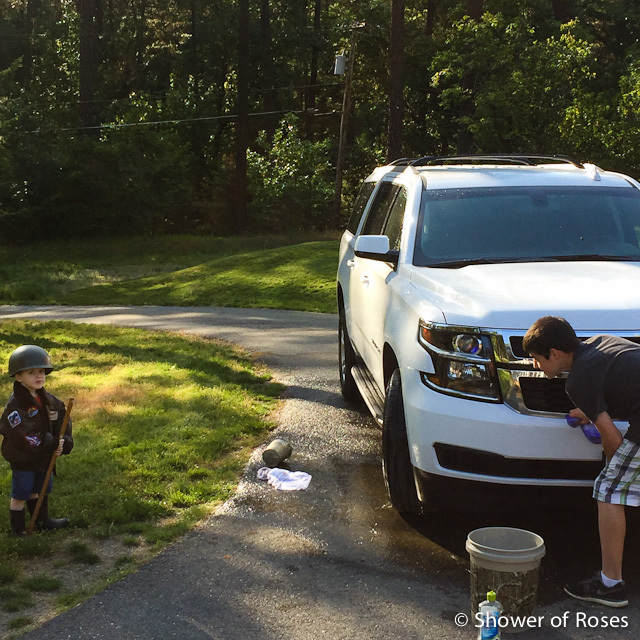 Ranger (laughing): "I'm washing the dirt off the car!" Everything is fine now, but our week got off to a rather traumatic start, just after midnight on Sunday morning, with a call to 911... My husband was one of the three who were sick on Saturday. He spent most of the day on the couch. Late that night, while (attempting) to walk from the living room to the bedroom, he leaned against the foot of the bed, said he thought he was going to pass out, and immediately fell to the floor. I'd never seen someone pass out before. He was pale/ghostly white and non-responsive. His eyes were wide open but motionless. It scared me to death. I yelled for the boys to bring me the phone while I tried to revive him and get him to breathe. I thought he was dying... My heart still hurts from the stress and anxiety! Thankfully he regained consciousness while I was on the phone with emergency services and seemed to be ok, but when he started to look like he was going to pass out again in the morning I drove him to the hospital. The vasovagal response was most likely triggered by dehydration and the stomach issues we were fighting. They hooked him up to an IV and kept an eye on him for most of the day. He went back to work today. I'm so very grateful that everyone is finally feeling better! I had no idea how much we were going to need them later that night!